One of the best ways to prepare children for school is to introduce them to the types of things they can expect to see during the school day or over the course of the year. 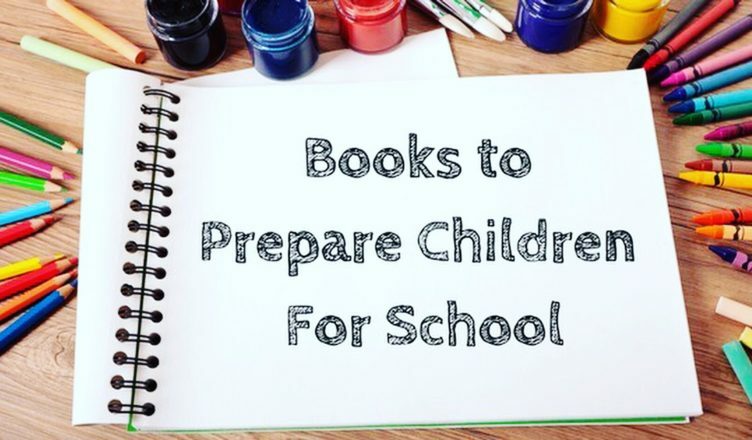 The following books do an excellent job setting expectations for school, so that children can set aside any nervous feelings and simply get excited for the adventure to come. This oversize picture book is perfect for young children starting nursery school or preschool for the first time. 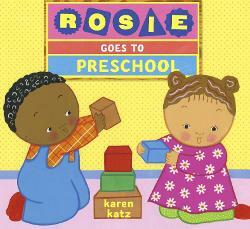 The story follows little Rosie as she joins a diverse group of children for a typical day at preschool. Each page is filled with vibrant, colorful illustrations. The text is sparse, but informative providing “Rosie Tips” throughout. For example, on a page showing this week’s job chart, the text reads, “And this is our job chart. Yay! I’m the lunch helper.” In the corner of the page, Rosie’s Tip advises, “Don’t worry if you don’t get the job you want. Everybody gets a turn to do each one.” Katz does a wonderful job of pointing out typical things children can expect to see at preschool such as having a cubby or hook with their name on it, playing with toys, sitting for circle time, using a job chart, creating art, going to the bathroom, playing musical instruments, etc. The children are seen with big smiles and appear happy throughout each activity providing reassurance to new students that school is fun. Karen Katz is well known for her lift-the-flap board book series and I’m thrilled to see her branch out into picture books. This is an outstanding introduction to preschool that is sure to help children transition to a new environment. 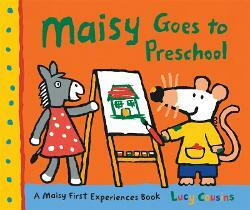 The Maisy series, which features the adventures of a little white mouse, are terrific books for young children. In this installment, Maisy goes to preschool where she and her animal friends enjoy painting, playing music, listening to stories, eating snack, going to the bathroom, and playing outside. The bright colors reflect the animals’ joy at being in school together and are sure to reassure children of the fun that they will have at preschool too. This call and response book begs to be read aloud to a preschooler or kindergartener. 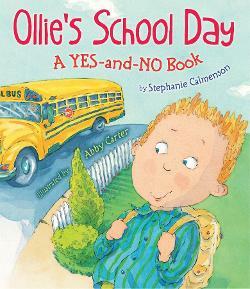 The story follows Ollie on his first day of school and asks the reader a series of silly questions. What should Ollie wear to school? “A bathing suit? No! A space suit? No! A police officer’s uniform? No! Will Ollie put on pants and a shirt, socks, and shoes? Yes!” I read this story to my son the first time he went to nursery school and he absolutely loved it. He would erupt in a fit of giggles at some of the suggestions for Ollie and it provided a perfect conversation piece to discuss how to act in his new school. This is a great book for a parent to read with a child or for a teacher to read on the first day of school to introduce behavior expectations. 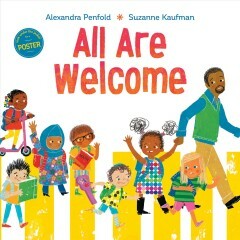 Poignant language paired with colorful illustrations featuring a diverse group of students driving home the message that school is a safe and welcoming place to all makes All Are Welcome by Alexandra Penfold and Suzanne Kaufman one of the best books about school I have ever seen. 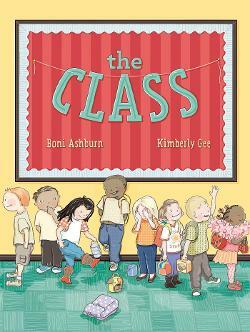 This is sure to become a classic classroom read aloud that is reread every year. What a cheerful and helpful introduction to school for young children! I love the format that includes a heading at the top of the page, a short explanatory sentence, and dialogue from a group of diverse children. 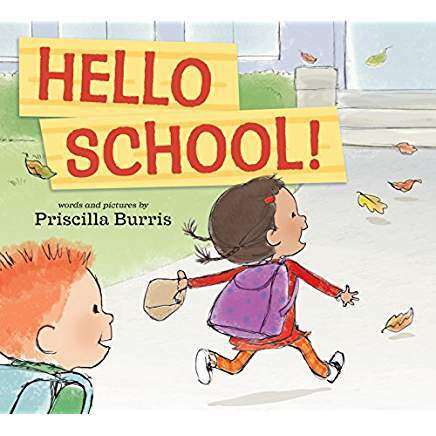 This is an excellent way to introduce children to preschool or kindergarten and teach them what to expect their first couple of weeks in school. My three-year-old daughter and five-year-old son just love this delightful book and asked for repeated readings. We enjoyed several conversations anticipating what their school would be like. This is a great choice for parents preparing their children for school and for teachers to read on the first day of school. With flowing rhymes and engaging artwork, The Class follows children of all shapes, sizes and backgrounds during their morning routine as they prepare for their first day of kindergarten. The beauty of this book is that so many different children are represented that almost every child will be able to relate to one of the characters. The children’s differences range from their skin color, their style of dress, their hair, to their meal choices and family life. An outstanding addition to the first day of school book genre. 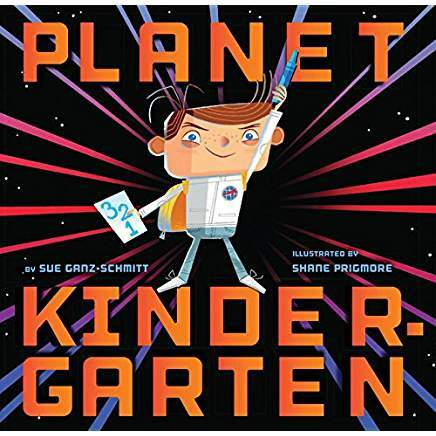 Planet Kindergarten is one of my favorite books to give children entering kindergarten. 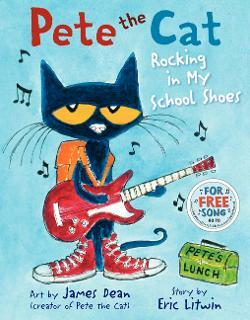 It is such a fun and clever take on a back-to-school book. Energetic artwork and lively text tells the story of an imaginative boy as he experiences his first day of kindergarten. Parents and children will both giggle at the boy’s amusing observations. “Gravity works differently here. We have to try hard to stay in our seats. And our hands go up a lot.” Through all the fun, the story still does an excellent job of highlighting a typical day filled with nerves, excitement, and a standard elementary school schedule. My son begged for repeated readings in the weeks leading up to his first day and when it finally arrived he was ready to blast off! 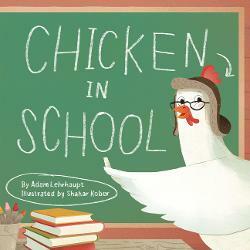 Short rhyming couplets and detailed illustrations tell the story of a typical day at school. 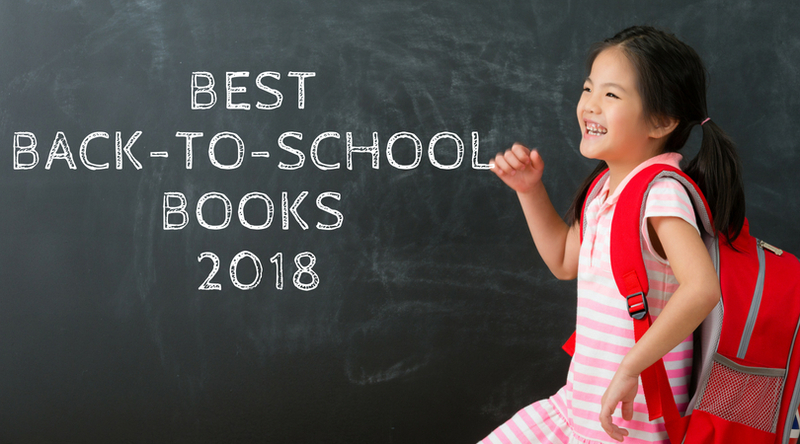 The story covers most activities including language arts, math, music, recess, snack, science, field trips, art, playtime, clean up time, and story time. While it would be impossible to participate in all of those experiences in one day, the book provides a nice overview for the school year. 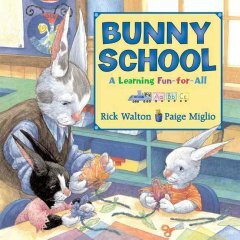 The illustrations feature active bunnies performing a variety of tasks, so there is a lot to admire during multiple readings. A nice book to ease the transition and inform students of what their days could look like at school. It is the last day of kindergarten and the about-to-be graduates share their favorite moments in kindergarten with each other including the block corner, writing center, arts and crafts, learning the days of the week, etc. 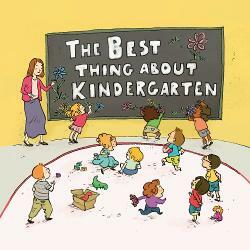 According to their teacher, the best thing about kindergarten is all the students. Even though this book technically takes place at the end of the year, it is a terrific tool for getting students excited about what is to come. 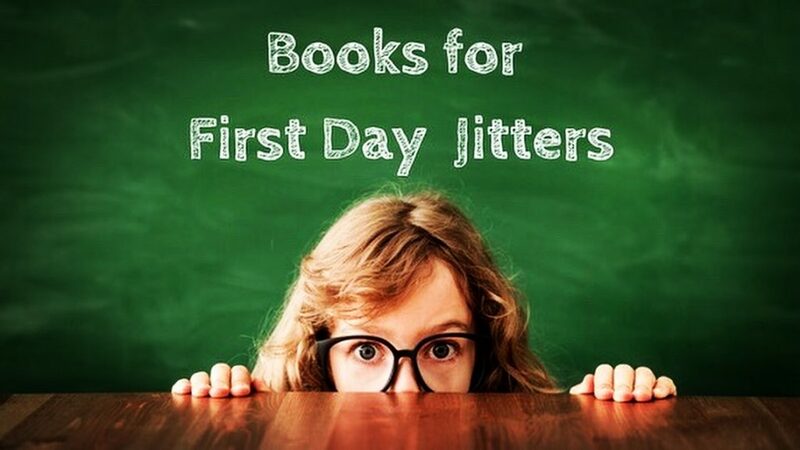 Children aren’t the only ones who can be nervous about starting school. 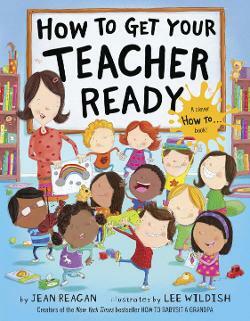 In this comical “how to” book, a diverse group of children give advice on how to help your teacher through the school year. The book provides a wonderful overview of what children can expect during the year focusing on milestones such as picture day, holiday concerts, 100th Day celebration, and field day. This is a great vehicle for parents and teachers to use to get children excited about the year to come. Check out the other books in this terrific series: How to Raise a Mom, How to Catch a Santa, How to Surprise a Dad, How to Babysit a Grandma, and How to Babysit a Grandpa. One of the most exciting things about school is finding out a child’s new teacher. After all, this is going to be the person who sees the child almost every day for a year! What better way to help children feel enthusiastic about school than to remind them how awesome and amazing teachers are? Teachers Rock! 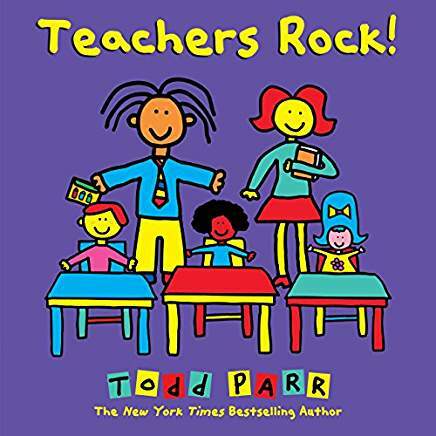 uses Todd Parr’s signature illustrations to celebrate the many special things teachers do and how they care about and support children. Perfect for starting school or Teacher Appreciation Day, this book is a fabulous read aloud to get children eager to meet their new teacher. The exuberant Zoey first seen in Chicken in Space (2016), is back and is ready to learn. She creates a school for the barnyard animals and acts as teacher. Using some unconventional methods, Zoey focuses more on building one’s imagination than spelling or math. This book celebrates outside the box thinking and taking risks; concepts every child should pursue. Zoey has lots of wonderful advice such as crayons aren’t just for coloring, they are for “creating adventures.” A fun read that will hopefully spark other children’s imaginations as well. This book is a funny and silly way to introduce various teachers seen at many schools. 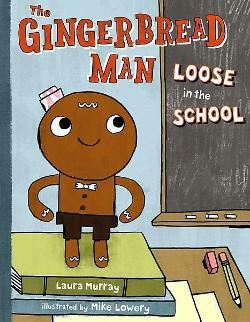 Our story begins with a Gingerbread man being baked by children in a school. As soon as the oven dings, he jumps out of the pan and runs loose through the school meeting many different teachers along the way including the gym teacher, the nurse, the art teacher and the principal. I like this book because it is a nice conversation starter for parents explaining the different types of teachers their children can expect to meet in elementary school. I grew up loving the Amelia Bedelia early readers and was thrilled to see her as a child starring in her own picture book. This pint-sized version of Amelia Bedelia is as literal minded as ever as she begins her first day of school with all kinds of hilarious mix ups. She confuses gym class with someone named Jim and when her teacher tells her to glue herself to the chair she uses glue to seal herself to the chair. 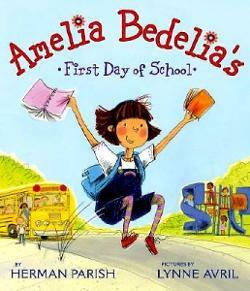 Amelia Bedelia’s exuberance is contagious and even though you may have to explain a few of the jokes to children, they will love her and can’t help but get excited for their own first day of school. Another reason I love this book is because it shows children different activities they may be doing in school such as going to music class, making art projects, running around during recess and gym, and reading books in the school library. This is the first book in the Amelia Bedelia picture book series. There are several others as well as numerous classic early chapter books and updated ones that have been recently published in the last few years. Lastly, there is also a new Amelia Bedelia chapter book series. Many back to school books concentrate on the anxiety of starting school, but I love this book because it focuses on what school is all about: learning to soar. 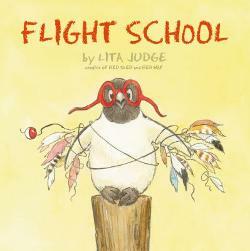 The story opens with a penguin entering flight school. When the teacher points out that penguins cannot fly, the penguin replies, “but I have the soul of an eagle”. Despite his many attempts, the penguin cannot in fact fly and prepares to depart brokenhearted. The teachers, however, refuse to give up. As all teachers do, they find a way to support their student, so that he does soar… at least for a little while. Many children may fail from time to time, but I hope that this tale of perseverance will reassure them that their caring teachers will not give up on them and will help them fulfill their own hopes and dreams. Bobby thinks his teacher, Mrs. Kirby, is a monster. She is green, growls and gnashes her teeth. When Bobby meets Mrs. Kirby outside of school at a park, however, he gets to see a different side of her. 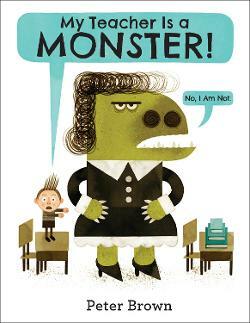 I love that this book humanizes teachers and allows students to realize that their teachers might not be as scary as they originally seem. This is a witty and hilarious read that is popular with many children. Peter Brown is an award-winning children’s author and illustrator. Be sure to check out some of his other wonderful books. A few of my favorites include Mr. Tiger Goes Wild, Children Make Terrible Pets, The Curious Garden, and Creepy Carrots. 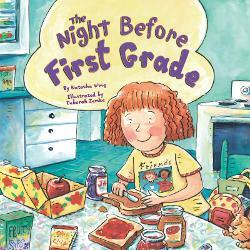 Natasha Wing’s Night Before series has become extremely popular and a go-to for many parents and teachers. Based on the poem, The Night Before Christmas, Wing changes the traditional rhymes to follow a group of excited and slightly nervous children as they prepare for their first day of school. 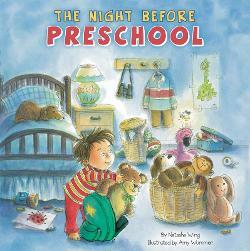 In The Night Before Preschool, most children are excited for their first day, but Billy can’t sleep. He is worried about making new friends. He initially hangs back as the other children play, but when a little girl shares her bunny with him at naptime he feels comforted and makes more of an effort. 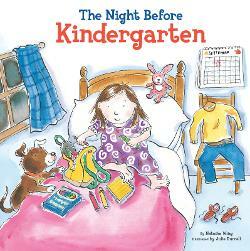 In The Night Before First Grade, a little girl envisions her first day of first grade with her best friend Jenny, but when they arrive at school, they discover they are in different classes. “We waved good-bye sadly and said, ‘See you later.’ I had to be brave because I’m a first-grader.” The girl enjoys her class and even makes a new friend. When she meets back up with Jenny, she discovers that first grade is going to be double the fun.